Huge thanks go out to all of you for a super release! The different elements that came together for this 11th anniversary wave truly represented a little bit of our past, present and future. It's always fun to see old friends again, and opening new boxes of Hades, Argen and Pheyden in their familiar colors definitely made us smile around here when they arrived. Then welcoming the new Zetonian/Mechabon mold into the family really sealed the deal for this round to be something extra special. Over the last few weeks, between the Toyfinity debut of the Zetonian form and our follow up reveal of the Mechabon form, we've been internally celebrating the completion of a project that Toyfinity's John Kent and I started over a year ago (with some of it actually dating back all the way to the first new Maxx Zero concepts). As always, working with John and the Toyfinity team was great, and we were able to create another new character together, through the study and reimagining of the classic robots we grew up loving. There's a lot of hidden stuff within this beefy little 'bot, but we know that the coolest discoveries will come from what each of you finds within the parts. Looking towards the next couple months, our next wave is set for early September, and will feature the return of the Mechabon, and maybe even a Miniborg for good measure. Also, keep your eyes peeled for a new Toyfinity assortment in August that spotlights the Zetonian and delves deeper into its origin story. As of this writing, all orders have been shipped out, so be on the lookout for those packages! Yet again, Michelle and Pj kept the boat afloat and moved with precision and speed through a pretty big stack of orders. Those new Mechabons are heavy little buggers! Barn tunes included another round of TBS with a follow up mix of new MGMT and much to Michelle's chagrin, Winger. I waited until Pj went home to turn that selection on. The last 11 years have been the best. Thank you so much for the opportunity to squeak out a few more. New projects are rounding the corner, and as long as we can, we'll keep at it. In closing, I also want to personally express my deep gratitude to Ron Daley, who has been building figures with me since the beginning. We worked side by side throughout the entire process of prototyping the new Zetonian/Mechabon, and hopefully the end result brings you as much happiness as we had while making it. It's always good to get a peek into the creative process that goes into the new molds, as well as a preview of what's to come. Knowing that both the Mechabon and the Miniborg will be making a return so soon is icing on the cake! I hafta ask, though, what came first: the Zetonian or the Mechabon? The new big "bell" body was where it all started, with the goal being to double as the core of a new armored Gobon and alternate RF base from its inception. The Zetonian came into tighter focus once we decided to actually move forward on the project. True dual development! thank you, Matt & co. for your vision, creativity, and hard work. i have collected various toys my whole life, but only stumbled into the Glyoverse about 18 months ago. i have come to consider Glyos toys to be the best toy concept that i have ever encountered. i have particularly enjoyed the last two waves, and look forward to the future. Congratulations, and play on! Thank you and you team. I got into the Glyos universe with my 1st drop on 7/12/17, and have order every drop since then. I have filled my Supercrayboth and crayboth collection from e-bay sales, along with other great figures from older drops. Your figures have inspired me, and made my remember those figures from my childhood. Thanks for bringing back Hades, as a new collector it's great to have a chance to get cool figures we missed out on. Keep having fun, we'll keep having fun, Thanks. Will the Mechabon come back with Gobon?! I need one of each, in matching colors!!! And, m Mechabon's bell has a little line in it, circling around. Is this a secret head that I should try to rip out, or just a manufacturing line? That's just a parting line, nothing hidden in there except some more PVC. 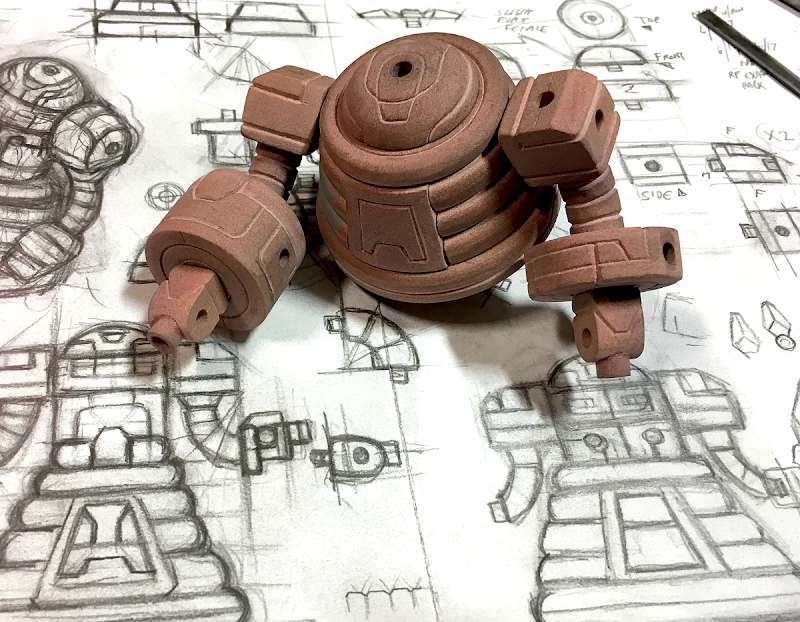 There are plans to release a double Gobon/Mechabon combo down the road, 100%! All I can really say is that my mom got the chance to see the new Mechabon and her only comment was "Oh! It looks like an old robot". She loves old wind up tin-toys and this immediately took her there. I love this stuff because it's fun but you guys really gave me something special this time around getting to see her reaction to what you've made available. Thank you. I'm not sure if this has been asked yet, but will the original Gobon still be in the mix going forwards? I know the Mechabon is meant to be an upgrade, but the original just has that bit of extra charm to me and it'd be a real shame to lose that. I keep trying to figure that out too! No one seems to answer. Old Gobon will still be around, no plan to scrap that mold! After all, Gobon is like Michelle's third child! I love this figure and as I said previously it is easily my favorite to date. Getting this one in the mail with all the paint apps is just awesome and I love all the little vizor heads that are hidden inside it. Cannot wait for more colors and build selections with this kit. You guys seriously need to release a Builder's Guide to all the Robo Force kits. The amount of secret builds in all 3 toys could fill out 40 or so pages I'd imagine! What I DON'T like is that you can't put the foot-head on the Mechabon, because then it can't stand. There should have been a spare. However, that is literally my only complaint. So I say "Success"!